Caverswall Minerals was set up over 40 years ago by June and Paul Bunn while Paul was a geography teacher. The latest version of the Caverswall Minerals system is administered from an on-site server which provides not only the Web Site Content and Catalogue editors but it also serves as the main office tool box for Purchase Orders, Order Processing and Delivery Fulfilment. All invoices and delivery labels are part and parcel of the processes and it all comes together in a single, easy to manage suite of application tailored to the needs of the client. Our Live Sync logic keeps the public site content up to date and fetches new orders down for secure, off-line proceessing and reporting. 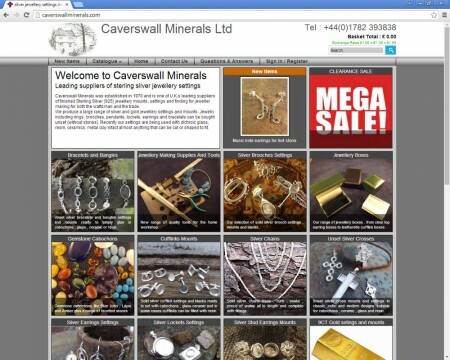 Not only does the site make money by selling Caverswall Mineral's products, it also saves money by removing the need to publish a glossy brochure. Traditionally taking many, many weeks to prepare and an extremely expensive task, this whole process has been replaced by our systems. Today, any Catalogue Page can be downloaded and printed directly from the site with the added benefit that it is always up to date with the latest products and prices.